This report covers the June meeting. Minutes of meetings are on the village website. The main item was an amended application for outline permission for erection of 1200 residential units, community facilities, education, retail, offices, recreational areas and associated highway works at Picket Twenty. The main changes are improved access to the town for public transport and replacing the golf course with a public open space. The application is in accordance with the Borough Plan and the council had no objection. There was also no objection to three minor applications for tree work at White Windows, Yew Tree House and Meadow Cottage, Forton. The council approved the accounts for the year to 31 March 2006. A copy is available on the village website if you'd like to see them. Before the meeting councillors toured the village. By and large the facilities and areas for which the council is responsible are in pretty good nick. 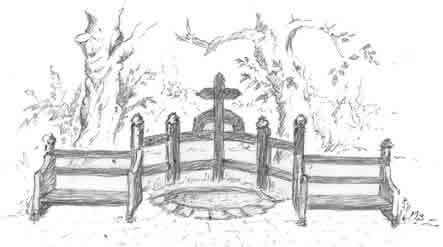 The Ash Burn Rest has been restored and will be opened on 3 July (see separate article). The county will be asked to clear footpath 32 from the back of North Acre (stop press - done and they have cleared it). Other paths are kept clear thanks to sterling work by volunteers. If you can spare a bit of time to help keep our paths in good order or would like to adopt a path please contact Martin Lampard (tel 720529). Training can be given if necessary. The council was delighted to hear of the success of the summer fun day and the plans for the youth club. The next Council meeting is at 7.30 on Monday 10 July in the Community Hall. Meetings are public and all parishioners are welcome to come and can speak. The Ashburn Rest has been rebuilt. David Scott's craftsmanship is excellent and the restored seat should last for decades. TVBC, The Vitacress Charitable Fund and the Parish Council have funded the project. The seat will be officially re-opened on Monday 3 July at 5.30pm by the Mayor of Test Valley, our own Jim Neal. All welcome. The Ashburn Rest was erected in 1868 by a notable character of 19th century Longparish, the Rev. Henry Burnaby Greene. He married Amelia Woodcock (great aunt to John Woodcock, currently patron of the living) and was presented as vicar by his brother-in-law in 1821. He built a new Rectory by the church in 1823, and was also responsible for improving both the Rectory and the church during his long incumbency. To make room for a front garden and give him more privacy he had the main village street, which used to go up to the lychgate and pass straight in front of the rectory, diverted. This meant knocking down an attractive small house, whose owners then moved opposite, to the house now known as Greenholme, which at one time was known as the Green Man, according to folk memory, to annoy the high-handed vicar. The cross which now stands in front of the old Rectory is a memorial to Henry Burnaby Greene's much-loved wife, Amelia, who died in 1867. He was also responsible for the grindstone. He died in 1884 aged 88 years, having held the living for an astonishing 63 years.